What do you need to know before you go to invest in Copper? Copper is a chemical element with symbol Cu that stands out with its great thermal and electrical properties. A discovery of copper as a metallic material dates back to 9000 BC in modern Iraq. During the bronze age, the copper was used as part of tools for stones treatment and later in 6th century BC in Roman Empire copper played a meaningful role as currency. These days the copper is used in a vast array of industries such as transportation, construction, electricals, machinery, automobile or IT. Hence, there are few ways to invest in copper, but before we need to understand a copper price behavior. A price of copper is extremely dependent on fundamental economic dynamics: Supply & Demand! Likewise in most of the other commodities, when there is an increase in price the producers enlarge production to meet demand, which lowers prices or vice versa in case of a decrease in price. Furthermore, if possible, there is also an option to substitute the product for something else that also decreases demand. How does the price elasticity work for copper? Is it as constant as in theory? Probably not! 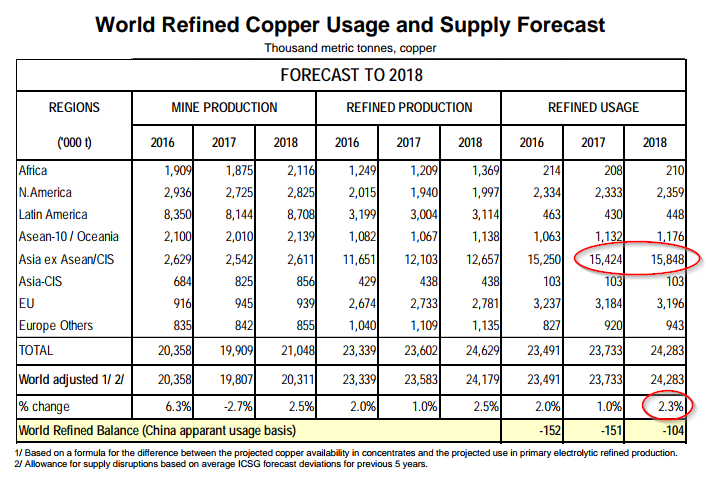 When a copper miner sees an increased demand and thus, wants increase production, the time difference between a decision and the desired output is roughly 3 years. This is way too long and there are reasons why such as environmental permits, the complexity of the projects, changes in ore quality, etc… Hence, the response of supply is very slow. When the price of copper crashed from 4.0 to 1.4 USD/lb. during the last financial crisis in 2008, the production did not decrease a bit, it stayed at same levels followed by further increases. Similarly, between 2012 and 2016 the price was declining while production increasing. In case of product substitution, there is a possibility to use aluminum instead of copper for the manufacture of conductors, wires, and power cables. However, the possible uses are only a few and even if, the world’s aluminum would disappear within few days to meet today’s demand. An acknowledged fact is the copper-oil price correlation is rather positive. From mining through production until the end of the process it is required to use machinery running on diesel. Hence, the changes in oil price impact the price of copper. Finally, the natural and social disruptions such as earthquakes and strikes can very well constrain the supply of copper especially in case of Chile who provides world’s 30% of reserves. With the demand side of the story, it gets perhaps more interesting. First of all two important questions need to be asked: What industries use copper the most and what countries use copper the most? 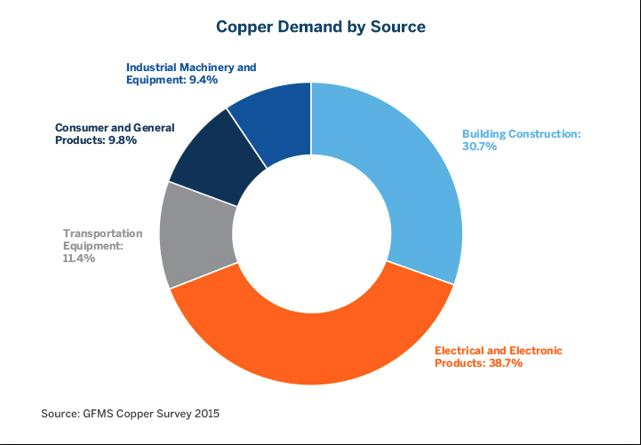 Building Construction and Electro Products cover more than two-thirds of demand and thus, a flow of business in these areas significantly influence demand levels of copper. It is well publicly known that innovation in electronic devices and generally technology is progressing so quickly that even the IT experts struggle to follow. As a result, more and more people can afford such perks like smartphones, wristbands, cameras. Companies need to keep up with decent hardware like laptops, servers, microchips, etc. To get something running you need cables, wires, and other electrical equipment. Everywhere you look you need electrotechnology and with an increased attempt for automation, this trend is unlikely to change. For instance, the semiconductor industry is booming, with companies such as Intel, Micron, AMD, Cypress Semiconductors enjoying very good times with great sales figures. Apple with their iPhones has become the biggest company in the world by market capitalization. Everybody wants a smartphone and manufacturers are trying the best to make everyone’s wish to become truth, you just need to provide some $$$. What do you need to make such devices? Copper! A second largest industry that needs copper is Building Construction. Not only commercial buildings crave this commodity, but also the family houses. For instance, in the US, a housing market is a big player in the economy as we could have learned from the financial crisis. All the houses need copper for electrical wiring, plumbing, weatherproofing, a typical family house requires on average about 220lbs (100kg). Thus, it is essential to pay attention to the figures of housing starts in a country. 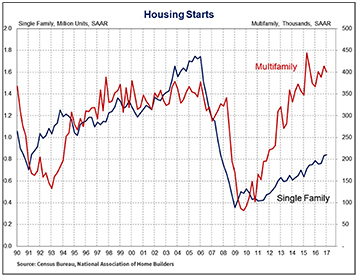 As seen above, the multifamily starts have already come to the pre-recession levels, while a single family is almost on half away with a lot of space to go, both trending upwards. As this trend continues, the construction industry is going to need more and more of this commodity. Regarding the geographic layout of copper use, it is evident that China is a top consumer and together with India and Japan they consume more than half of copper produced. China is re-opening the electrolytic operations that had been temporarily closed, which lowered demand for copper in 2016. Chinese state metal agency also said that the copper demand is re-emerging due to power network upgrades and investments in cleaner energy. Summing all up together projects excellent investing possibilities in copper or copper related business. There are four different ways how to invest in copper. You can buy copper bullion in form of copper bars or rounds – easy. Then, like with other commodities, there is a possibility to buy copper futures via your broker – less easy than bullion but still pretty straightforward. Thus, you basically invest in copper futures. The third option is more interesting and that is trading the exchange-traded funds (ETFs) – the funds track the commodity and thus, it may eventually be more profitable than previous two options. The last option and the most profitable one is to invest in copper mining companies. 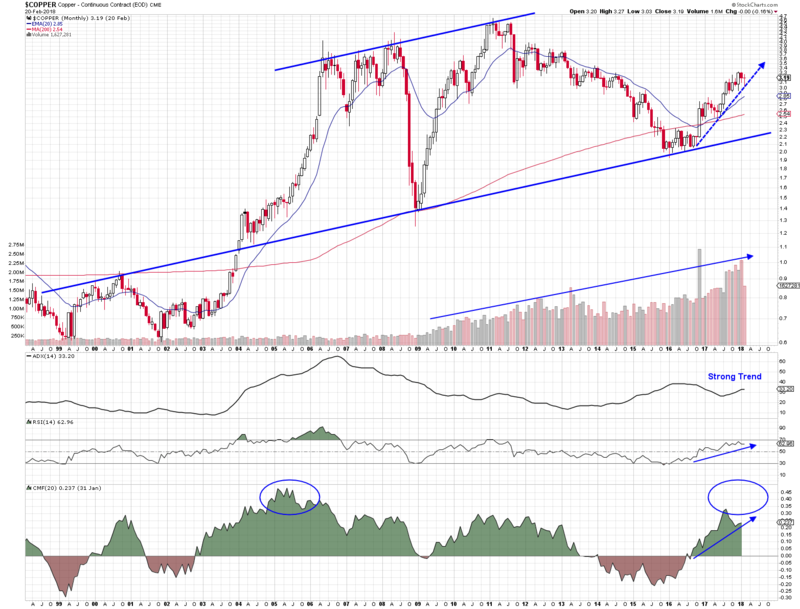 Before we go deeper into mining stocks, let’s have a look at a commodity price, its trend, and technical analysis. 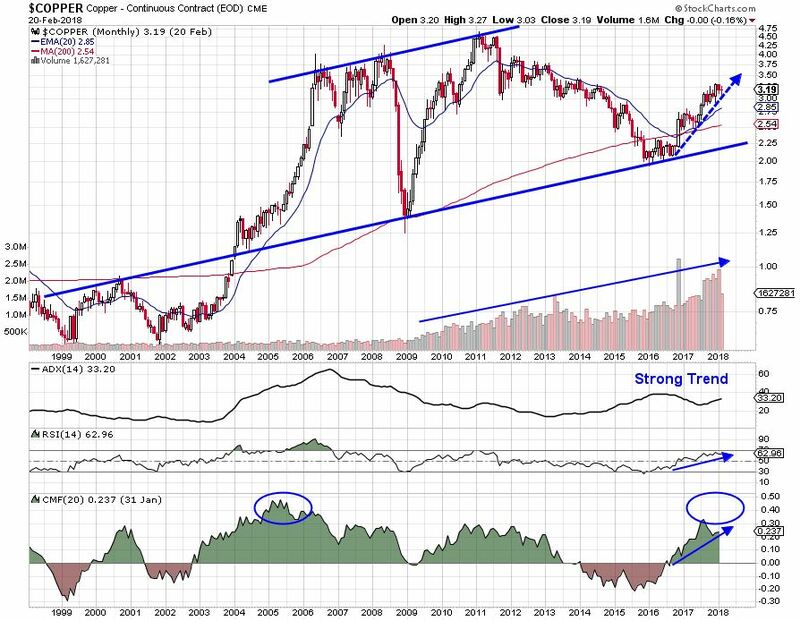 Below we are looking at 20 years long journey that copper has been going through. The price topped at 4.5 in 2011 and then entered a 5 years bear market stopping at its long-term support level depicted by lower blue line. At the end of 2016 price reversed, broke through the resistance (in this case its depicted by 20 EMA) and continued its bullish trend for the entire year 2017. 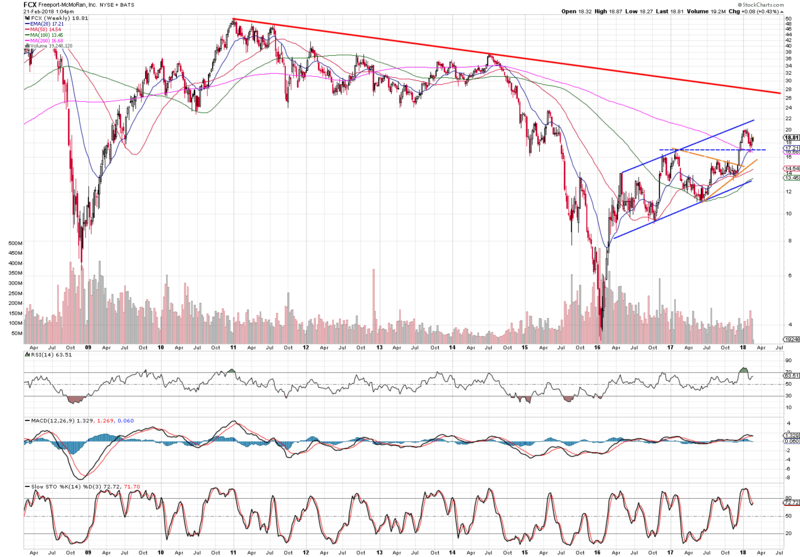 Technical indicators are supporting current trend quite well. ADX of 33 is showing a strong trend, RSI is above 50 – still a lot of room until it gets overpriced and CMF has been showing a lot buying power – at the moment entering areas of potential super gains when compared to historic levels in 2005. 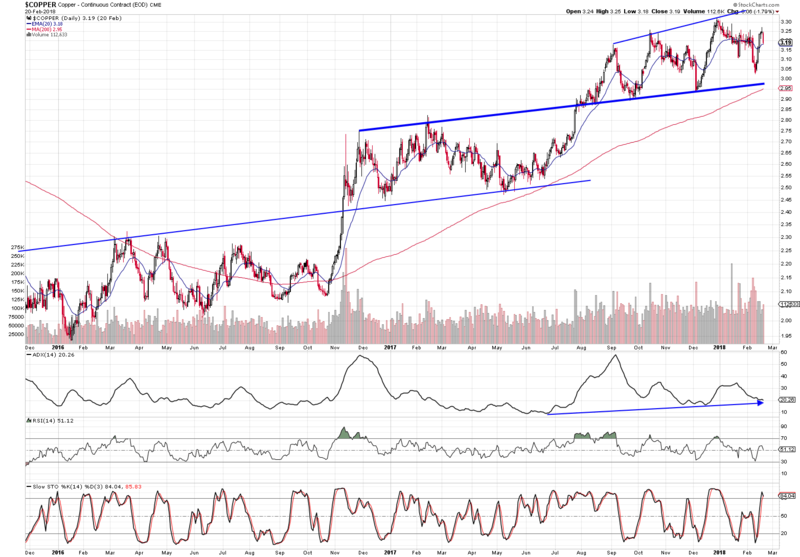 While focusing on recent copper price movements, we can see 3 bull channels within last 2 years. At the moment, the most important level to watch is the center blue line that serves as the support line. For a copper mining company to be profitable, the copper price needs to stay above 2.60 USD/lb. The final increase above this level happened in July 2017 and the price kept rising. At the moment the price is moving between 3.0 and 3.30 USD/lb. This is surely enough for mining stocks to bring satisfactory if not even surprising earnings results. Their commodity focus is mostly wider, mining other materials such as iron, gold, coal, nickel, etc; and thus their exposure to another commodity market may skew their final results at expense of copper division. 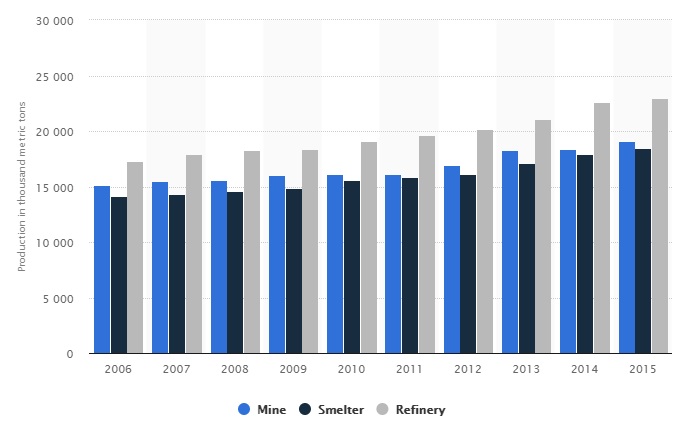 Since this article targets specifically copper, I have chosen three copper miners that have their business models entirely or mainly aimed at copper. This mining company from Phoenix has established an upward channel depicted by blue parallel lines. At the end of last year, it managed to break through its 200 MA. Then, it successfully tested its new support level (blue dashed line). The stock price is expected to move upwards. The important level to watch is a 7-year long resistance (red line), although there’s a lot of profit space between current price and target of around 26.0. Another Phoenix-based company with a share price increase probability has broken its 7 years old resistance in July 2017. The miner is enjoying the all-time highs these days with price bouncing from 20 EMA. 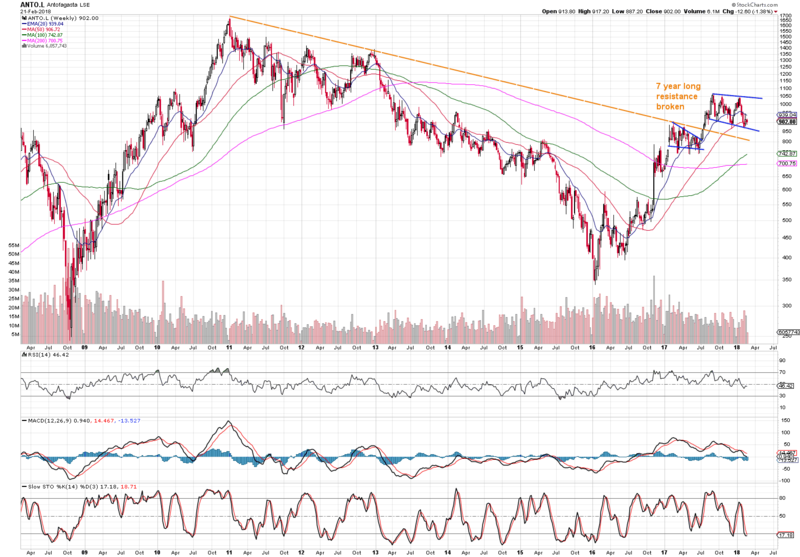 The orange dashed line has become a long-term support level. London based copper mining company with 4 mines in Chile. Mining represents 90% of its revenue. 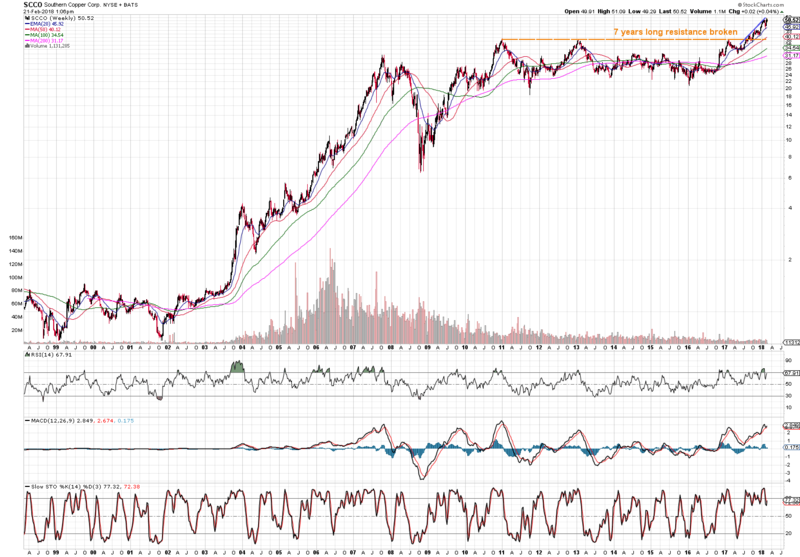 The stock has broken the resistance also in July last year and now is set up for further gains. Based on above findings it is perhaps reasonable to invest in copper or copper related businesses. The current trend is showing an upward direction with significant profit potentials. This post is only an opinion of the contributor. It serves for informative and educational purposes only. The article is not an investment recommendation. Trading any financial instrument involves risk and thus, you should consult every financial decision with your financial advisor. Read our full disclosure!